As I repeatedly try to write this, all my words seem false. I keep coming back to the question taped to my keyboard “WHAT DO YOU WANT TO SAY?” The answer is, I want to say that I’m okay. I’m doing alright. I finally feel whole, grounded and confident… most of the time. And the times when I don’t, I know how to bring myself back to that place of grounding. I don’t spend much time lost anymore. I know my way through the woods and with each passing year, I know my way a little better. Even as paths change, I can find those landmarks that will lead me back home. I want to say that I did it! I fought all the demons and won. That I am not alone. That I will survive. That I know love and have it in my life. That I am worthy and worthwhile. That I feel, deeply. That after all that I have faced, I stand tall. I did it. I did it all. To address the anger towards my mother’s neglect and abuse, I wrote a letter. Knowing that my mother would not be able to hear what I said, I didn’t send it, which allowed me to be shockingly candid. My therapist was speechless when I read it to her. It feels good to read it. It is a victim’s letter from the girl who was silenced for so long. It felt great to give a voice to that part of myself. To say that the way I was treated was wrong. That I was a child and should have been allowed to be a child. To be taught, loved and guided. Not shut away, manipulated and terrified. To address the damage I have had to fight so hard to overcome. To, literally, learn how to breathe again because I was always so terrified that the sound of my breath would draw the attention of her rage. To refuse to be invisible any longer. And to say that it was all so very unfair. Form grieving the unjust way my mother used me, emerged emotions that I still had about a woman who had acted as a surrogate mother to me for a large part of my life. Years ago, we ended up on opposite sides of a bad divorce and I had not seen her since. I always mourned the loss of her in my life. I couldn’t even talk about her without crying. My therapist suggested that perhaps there might be something I needed to deal with there. (What?! Really?!!) She suggested I also write a letter to this woman and tell her what an impact she had on my life and ask if she wanted to meet. My biggest regret of that relationship was that I never got to say goodbye to her in person. She was still out there somewhere and I never got to tell her how much I love her. So, I wrote the letter and this woman agreed to meet me. You may think this seems like nothing, but this divorce created a divide between families that would make the Montagues and Capulets seem chummy. It was an unspoken rule that we would never see each other again. This meeting was completely illicit and will never be spoken of to any of the family, but it happened and I will cherish those few hours until my dying breath. It is my most special memory. Despite being treasonous, this woman met me because she needed to see me just as much as I needed to see her. She was my mom and I was her child. It was the first time that I understood what the unconditional love of a parent looked like. We both spent most of the lunch in tears and reaching for the other’s hand. It was beautiful. Imagine if you lost a parent and by some grace, you were allotted 2 hours with them. It was magic. Now, I can’t talk about that day without crying, but they are my favourite tears to cry. I relish them falling down my face. I had a mom who loves me and wants nothing but my happiness and is just as sad that I am not in her life as I am that she is not in mine. I would cry these tears forever because they represent that love. It is beautiful. That day healed a part of my soul that I never thought could be healed. That day changed me forever. I was given a gift that can never be taken away. We parted ways knowing that we would likely not see each other again, but she left me with the assurance that if I ever need anything, she would still be there. I had the love of a mother. A good mother. With no strings attached, no conditions, just pure love, even in the face of adversity. I had never known that before. I kept seeking it from a partner, but that’s not the place to find it. I finally felt whole. So, that’s what’s been happening over the past six months. It feels like the final battle that won the war. 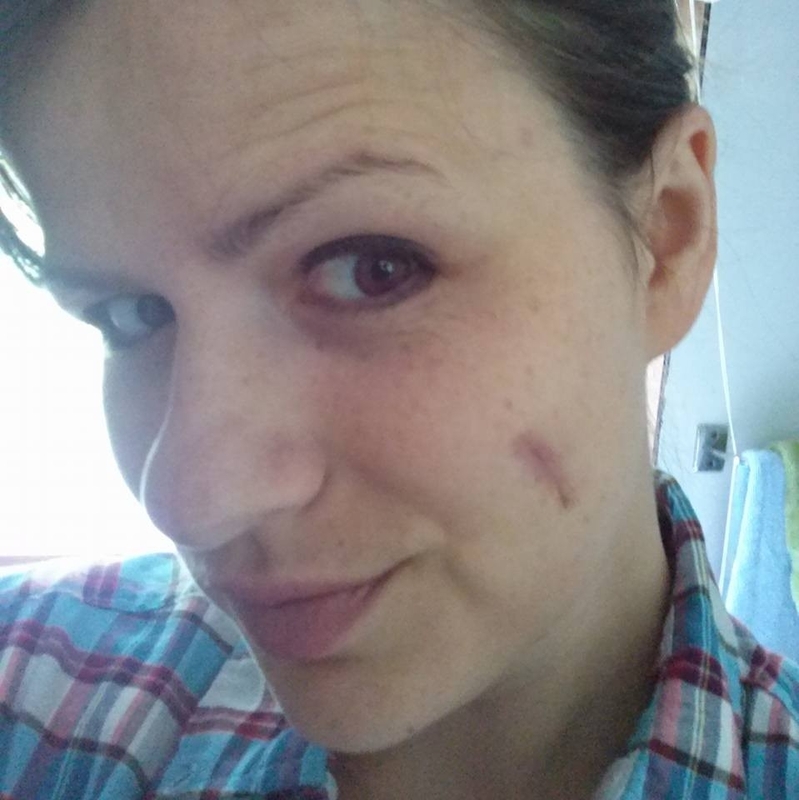 My fight was over and I could return home, mostly whole... there is now a large scar across my face. It is my favourite feature. It is my battle wound. Seven years ago, I discovered a part of myself that I had completely forgotten existed. At the same time, a cyst developed on my left cheek. I had it checked and it was nothing serious and it was never mentioned again until this year. Then it was mentioned all the time. I got it checked and the surgeon said it had to come out. For seven years, it has felt like there is a pile of garbage in my cheek. Now, I have a two-inch scar that I love. I feel like I’ve come out of a war and am returning to this new life as a changed person. As I was reading through old posts, I had written that I wish people could see the scars that are on the inside. To me, this is what the scar on my face represents. It is right there for everyone to see. I earned this scar. I fought and survived. I wear it proudly. There was so much more that I had planned to talk about, but I think I’ll save that for another day. Right now, I want to celebrate all that I have achieved in the past three years. I want to acknowledge the courage it has taken to let myself be so exposed publically. To stand up and share my pain, fear, and darkness with the hope that others may find solace in it. I have to admit that lately, I have been questioning whether anything I have to say is worthwhile… until tonight. This magic night, when I was reminded that even if I don’t always see the impact, I have impact. I am a lighthouse. I have made the journey through the darkness and when others get lost, they seek me out. I lose sight of that sometimes. As scary as it seems, there is a power in remaining vulnerable to others. Tonight, someone dear to me reached out. They remembered me telling them about when I hit rock bottom and how I came out the other side. They said they needed help finding their way. They turned to me. Then a flood of similar examples flowed through my head. This is worth it. It does mean something. And, if for nothing else, it means something to me. This is my journey. I have been thinking about where to go from here. Life has become substantially less dramatic. Therapy is winding down and I am living; simply living. So now, I am going to retrace my steps and create a road map of the journey I took. I know so many people in HEP therapy now, that I feel like it would be useful to create a guide book of strategies I used to survive my journey, what to expect and how to remember that everything is going to be okay (even if it feels like you’re going to die). Thank you for sharing this journey with me! Thank you for supporting me as I stumbled through the darkness. Thank you for standing by me, even if I couldn’t see you there. And thank you for continuing to follow me on this path. I’m so happy to be in this life.